Welcome back to our ongoing series of Reading the Hugos: 2017 Edition! Today we take a look at the six finalists for Best Novel. This time around, two of the finalists were also on my nominating ballot. All the Birds in the Sky and The Obelisk Gate were standout novels of 2016. They were also the only two finalists I had read prior to the announcement of the final ballot, so this was a category of discovery for me - which is unlike last year when I had four of the five finalists on my nominating ballot. Let's get to work, shall we? Too Like the Lightning: I tried, folks. I tried. Except for Death's End, this was the finalist I was more concerned about reading. Something about the futuristic utopia written with stylistic flourishes harkening back to the 1800's (despite being set in the 2400's) just didn't work for me. I know I gave up on the book too soon, but three chapters / 40 pages seemed to be enough to know that I didn't care enough to even to the central mystery / conceit / story of Too Like the Lightning. Reading other reviews suggest that there is richness to be found, if only I take the time to push through. Perhaps I will try again in the future (after all, my reading of This-Census Taker changed on a second go-round), especially if this happens to win the Hugo Award. Though, given how other awards have shaken out so far this year, this seems somewhat unlikely. I do subscribe to the idea that sometimes we come to a book at the wrong time to appreciate or enjoy the work and coming to it again at a different time results in a different and stronger appreciation. Hopefully that'll happen here, otherwise this is just a miss for me. No Award: This is where I normally put my standard disclaimer about the two ways that I use No Award on my ballot (see my coverage of Novelette for an example) and in using that, I acknowledge that I generally don't consider a work that isn't to my taste inherently to be below No Award. I think I also have a third way to use No Award. Though I consider the general quality of Palmer's fiction to be strong enough to be above No Award, if I elect to not finish a novel / story / work because of disinterest and it generally not working for me, I probably shouldn't consider the work worthy of a Hugo Award. Though, I do think there is a better than reasonable chance I would rank this higher on my ballot if I gave it a second go. But life is too short to read books that I don't care about. Death's End: Out of the six finalists, Death's End was the novel I least looked forward to reading. While I appreciated the ideas in 2015's Hugo Award winning novel The Three-Body Problem, I found the execution wanting. I was interested enough to give The Dark Forest a shot, but I wasn't impressed. The Dark Forest was terrible and I was done with the series until this nomination. Some of my criticisms of the series remain. So much of the story is presented in a heavy handed and blunt manner and most of the characters read as cardboard sketches of better written characters. Despite this, I enjoyed Death's End far more than I expected I would. 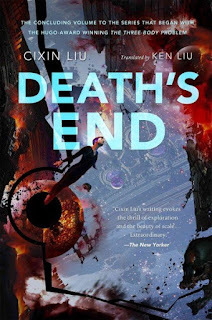 I loved Cixin Liu's imagination and vision of the far future. The concepts of how humanity might be able to hide from galactic threats, how they respond and fail to respond, and what that looks like over hundreds and thousands of years - it's all fascinating. One thing that Cixin Liu does very well here is continually jump forward in time so that we don't spend too long in any one era and get bogged down by the clunk. We keep pushing forward with the ideas and I was fairly well hooked. I still think that I enjoyed this novel more than it merits, but I was pleasantly surprised by how well Liu closed off the series. A Closed and Common Orbit: I thought I knew what I was getting into because even knowing that A Closed and Common Orbit was a side story spun off from the delightful A Long Way to a Small, Angry Planet, I had made the assumption (after avoiding reading other reviews) that this novel would be more of the same. That's not a criticism because I wanted more of the same. I wanted more of the sort of Firefly-esque adventure of the Wayfarer. This is not that. 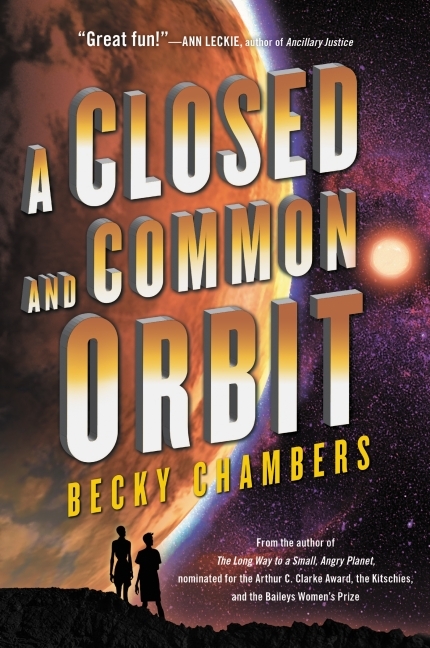 What A Closed and Common Orbit is is a tighter and much more condensed story focused on two contained storylines. First, that of Lovelace (the ship's AI from the first book) now down on a planet and having the opportunity to inhabit a body and pass as human, and all of the physical and emotional challenges that may incur. And yes, I did say emotional. Second, that of Jane 23, a small girl raised by AI in an uncompromising existence. A Closed and Common Orbit shows the development and improvement of Chambers as a writer and she nails the payoff. 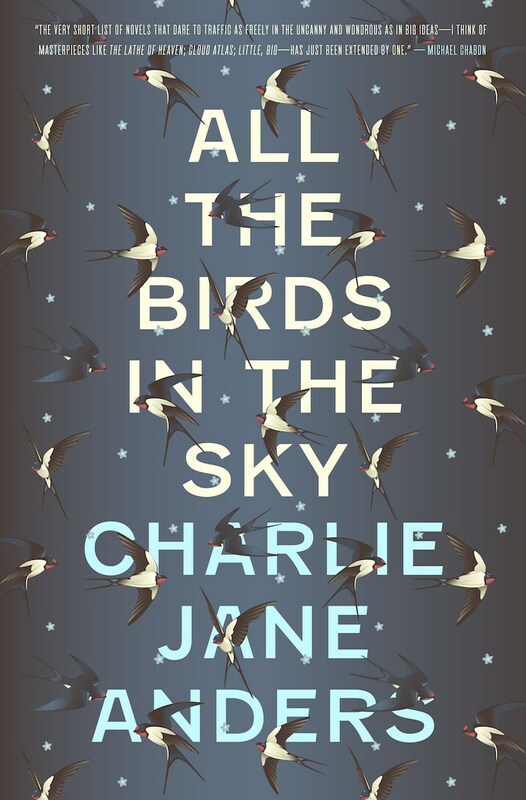 All the Birds in the Sky: Only when it comes to reading for an award does initially encountering a novel in April pose a problem. 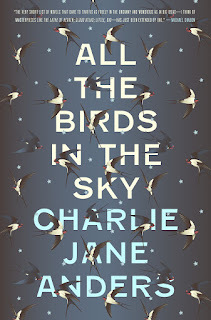 It has now been more than twelve months since I read All the Birds in the Sky and I am comparing that memory against novels I reading for the first time just this month. Luckily, my love for All the Birds in the Sky stands strong. To fully quote my nanoreview published back in April: "Publishing does not seem to have the thing the film industry does where the movies expected to contend for awards are most often released in the last quarter of the year, even just in a couple of select theaters so as to qualify for that year's Academy Awards. Seldom does a movie premiere in January and manage to be recognized by the Academy the following year. Even so, there is still a tendency to say in reference to a novel, "we'll still be talking about this at the end of the year when it comes to awards or best of lists" All the Birds in the Sky is that sort of novel, published in January and putting a stamp on the entire year that it must be considered as one of the year's best. It's about magic versus technology, about growing up, about alienation and finding someone or something to connect with, about optimism amidst growing despair. All the Birds in the Sky is wonderful." Happily, my nanoreview was prescient. We are still talking about All the Birds in the Sky. It is currently a finalist for the Nebula, Hugo, and Locus Award for Best Fantasy Novel. Reading a novel "about optimism amidst growing despair" this year can be a cathartic and wonderful experience. 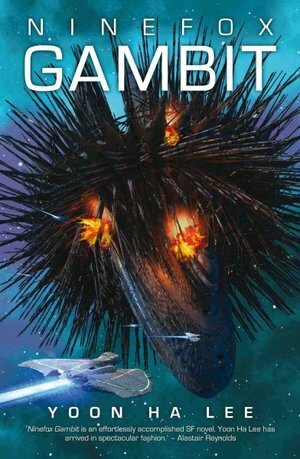 Ninefox Gambit: It was a near thing, whether or not I was going to finish Ninefox Gambit after the opening several chapters. 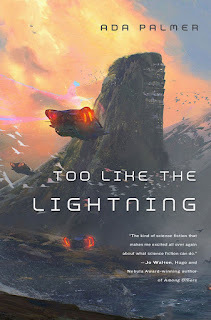 It's not that the novel is necessarily a slow burn, but the idea of military science fiction built around mathematical equations was a tough sell and it took some time for me to settle in as a reader. Once I did, everything fell into place - even when I could not grasp how anything worked. The technology is based around math combined with a need for consensus. The movements of the soldiers are part of the equation, and if everyone isn't doing exactly what they are supposed to do for a particular formation, it all falls apart. There is an argument to be made about how that is also representative of actual military action, but Yoon takes the level of discipline required to a different level - to the point that even ritual actions performed during personal time will build to that mathematical consensus. It's math as magic, because a strong enough formulation can alter reality. But here's the cool thing, because the math is so tightly controlled as a "calendar" by those in power, anyone opposed are guilty of heresy and are marked for extermination. But that heresy, that opposition to the calendar also results in what is called "calendrical rot" - the lack of consensus with the math of the ruling party causes technological and magical breakdown. Oh, and Ninefox Gambit is chock full of all sorts of violence and plotting and betrayal and includes a four hundred year dead general. It's a difficult novel to wrap one's head around and if not for all the praise from readers I respect and the multiple award nominations, I might not have given Ninefox Gambit the initial commitment I required to really engage and appreciate it. Once I did, damn. This was fantastic and a standout novel for sure. 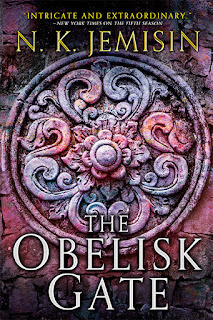 The Obelisk Gate: When the novel I picked as my favorite / the best novel of 2016 is also a finalist for the Hugo Award it should come as no surprise that it is also my top pick for the Hugo Award. Jemisin brings the world breaking cataclysm of The Fifth Season to the forefront. We get hints (and sometimes flat out told) how bad things will get, but what choice does anyone have but to try to survive? 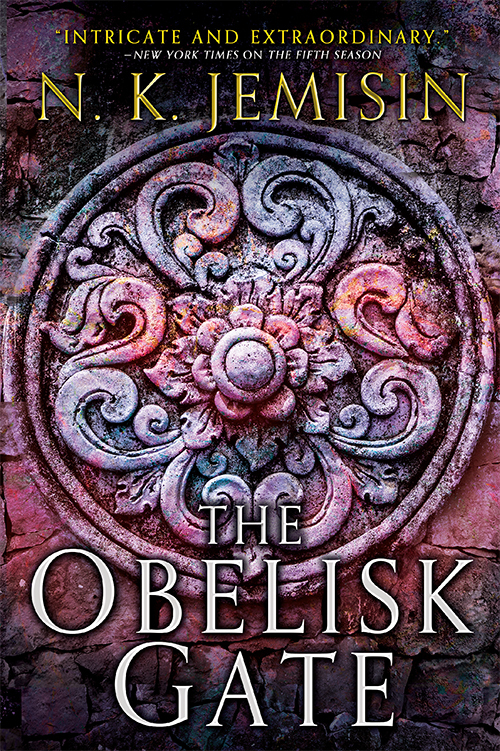 To quote my review: "The Obelisk Gate is not specifically a story about family, but then Jemisin is not telling a story of just one thing. She's weaving a rich and brilliant tapestry that pulls from family and destruction and loss and hope and love and disappointment and oppression and earth magic and everything else that can be mixed in with individual threads forming larger weaves and all coming together into something far greater and far more beautiful than a description of any individual thread could get across." Also, "There is so much going on in The Obelisk Gate and Jemisin has so many balls in the air that a lesser writer would have begun to drop them by now. Not Jemisin. She is fully in control of The Obelisk Gate. Epic fantasy does not get better than this."